Wonderful blog, and it is fascinating to reflect where his amazing and disturbing oevre comes from. The witch one; I have tried to bend my mind to it in the light of my knowledge. 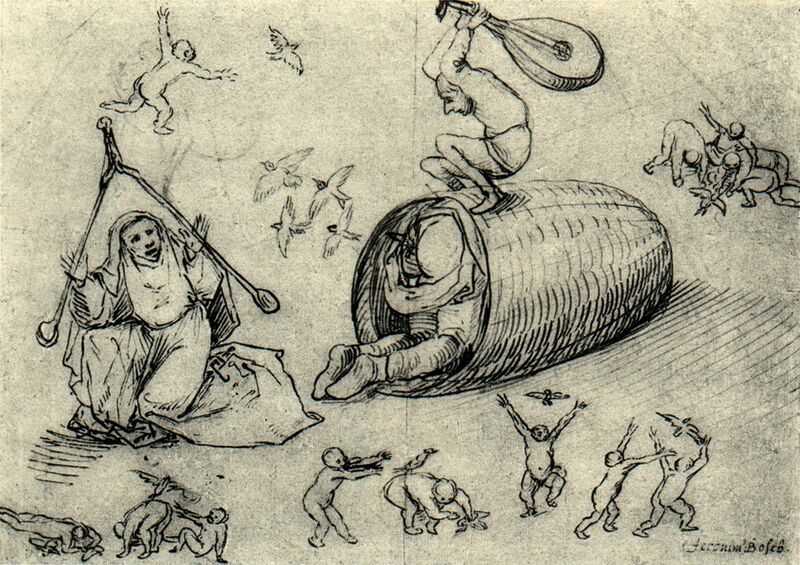 One of the classic ways of offending a witch was to take her swarm of bees. Is the woman beneath the curious wish-bone thing a witch, or are the witches the ones at the back? One thing is clear, the guy inside the beehive is being walloped with the lute. If there were bees inside the hive, the unfortunate inmate would be suffering front and rear. I guess, though, that the hive represents something whose significance we have long since lost, just as dogs, in old paintings, represent unrestrained lusts - though they often are so lovingly depicted that I wonder if other things are going on. Definitely fascinating. He has to be an early surrealist; on the other hand, I guess the medieval world picture was pretty surreal anyway, so if he just illustrated it, he'd be surreal. But on the other hand, nobody went as far as he did. Even the angel has an insect-like quality, when other painters depicted them with birds' wings. I'm ashamed to say I hadn't heard of Bosch until some years ago I read Michael Connelly's fiction novels featuring his complex cop Hieronymous 'Harry' Bosch, named after the painter by his equally complex mother. Needless to say, I then had to look up the works of the original Bosch & now always associate the real with the fictional Bosch. luckily I have seen a real Bosch at the National Trust's Petworth House Gallery in W Sussex. Incidentally, the fictional Bosch's favourite picture is the Nighthawks by Hopper (people sitting in a 1940s American diner at night), which I was also obliged to look up & now really like. Thank you for the blog, Miranda. 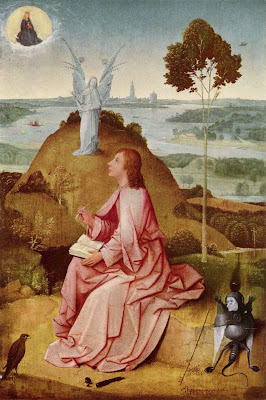 Earlier in the year there had been an exhibition in Rotterdam entitled From Bosch to Bruegel that featured many of the paintings shown in Den Bosch plus those by contemporaries. A film was also made of the Bosch exhibition, entitled Jheronimus Bosch, Touched by the Devil that provides a fascinating insight into the politics behind the exhibition. A trailer can be seen here: https://vimeo.com/146311294. Thanks, Leslie. I couldn't read the beehive witches at all but it's interesting to know there was a connection.